On nearly every Sightsailing public sail or private charter, we’ll cruise by Fort Adams State Park in Newport, RI. The former army outpost, situated just inside the opening of Narragansett Bay, has been employed on and off in protecting Newport Harbor since the 1700s. Come learn about its history, and enjoy numerous other activities at this prime stop while you’re in town. Designated as a state park in 1965, and a National Historic Landmark in 1976, guided tours of Fort Adams are available to learn about 180 years of history of this storied fortress — revealing tales of military life, architectural details, and military technology of the times. Tours are also available of the beautiful Eisenhower House, serving as the former president’s “Summer White House” while in office. 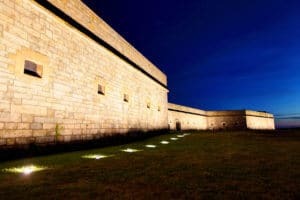 And if you dare, you can even take a guided “ghost tour” of the Fortress (popular in October), through underground tunnels, and explore the nature of reported haunting. Fort Adams is home to the well-attended Newport Jazz Festival and Newport Folk Festivals. These summer events see throngs of attendees who picnic on the lawn, soak up the sun, and revel in unparalleled views of the Newport Pell Bridge. Fort Adams also features the popular Bay Walk, a roughly 2.2 mile path around the park that offers views of many beautiful Newport sights, including Castle Hill Lighthouse, Rose Island, the Newport Pell Bridge, Clingstone, the New York and Ida Lewis Yacht Clubs, the Newport waterfront, and gorgeous sunsets over Jamestown. If you’ve got a day to spend, the park also features fishing, boating, a few small rocky beaches, and a large, grassy space for sporting and picnics. Located 3.7 miles from the Sightsailing office and docks on Bowen’s Wharf in downtown Newport, Fort Adams State Park offers ample free parking and public restrooms in season (May – October). Or wave as you sail by on the Aquidneck! We’d love to show off Newport’s own Fort Adams from the bay and answer questions about this, and many other, Newport landmarks.